So far 2017 has been a banner year for sports prodigies. In June, Mima Ito and Hina Hayata, both 16-year-olds, became the youngest pair from Japan to reach the semifinals of the women’s doubles at the Table Tennis World Championships, winding up with a bronze medal. The same month, 14-year-old Sota Fujii won 28 straight official matches, equaling the all-time winning streak in the traditional board game of shogi. As Japan’s youngest professional, the modest Fujii received celebrity-level coverage on TV and in the print media during his streak, and has been credited with inspiring a shogi boom among the country’s youth. While no one is disparaging these pursuits, they cannot compare with the media’s coverage of baseball, which is solidly established as the nation’s most popular sport. Out of the 24 recipients of the People’s Honor Award bestowed by Japan’s prime minister, for example, professional baseball players have accounted for four, more than composers, actors, singers or practitioners of any other sports. When the Waseda Jitsugyo High School baseball team was eliminated from competition on July 30 by Tokai University Sugao High School by a score of 6 to 2, the nation let out a collective groan of disappointment. Elimination meant that Waseda Jitsugyo would not go on to this month’s summer high school baseball tournament at Koshien, which means that Japan’s all-time record of home runs by a high school player, held by 18-year-old slugger Kotaro Kiyomiya, would not be beaten for a while, if at all. While he did hit several in the playoffs, Kiyomiya is currently stalled in a two-way tie with Hiroki Yamamoto, formerly of Kobe’s Shinko Gakuen High School, at 107. Kiyomiya, son of Waseda University’s former rugby coach (who now heads the Sungoliath team sponsored by Suntory Ltd.), has demonstrated an impressive ability to knock baseballs into the outfield bleachers. It has not escaped fans’ notice that Waseda Jitsugyo High School also happens to be alma mater of all-time baseball great Sadaharu Oh. As a left-handed pitcher, Oh led his team to victory at Koshien in 1957 and was recruited by the nation’s most popular team, the Yomiuri Giants. After a coach recognized Oh’s batting ability he was moved to first base, where he could play every day, and he proceeded to slug a career 868 home runs. This figure, remarkable by any criteria, far surpasses U.S. major league record holders Barry Bonds (with 762) and Henry Aaron (755). Some fans have begun comparing Kiyomiya to another high school prodigy, Hideki Matsui, who also batted left and threw right. After joining the Giants and dominating the sport in Japan, Matsui enjoyed several productive years with the New York Yankees and other MLB teams. Shukan Asahi, a weekly magazine published by the Asahi Shimbun, which sponsors the Koshien tournament, has accorded Kiyomiya what could be described as an unprecedented honor: for the duration, he’s the exclusive topic of a weekly column by sportswriter Yuji Yanagawa. 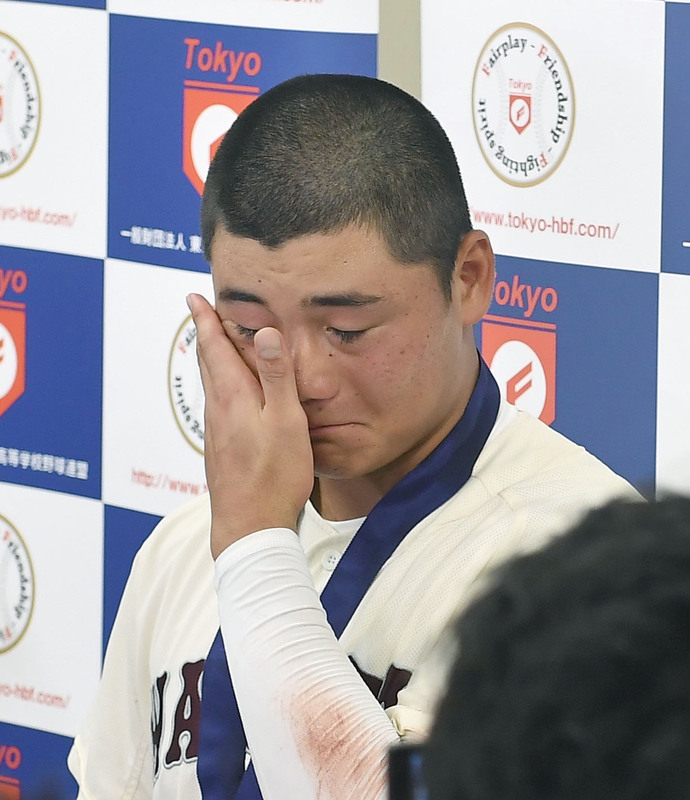 After the loss to Tokai University Sugao ended his chance to vie for the nation’s top high school team at Koshien, Kiyomiya unashamedly shed tears before the TV cameras. And perhaps Kiyomiya wasn’t the only one feeling let down. The aforementioned Shukan Bunshun quoted several academics and researchers who have made a study of the business side of baseball — or, if you prefer, “Yakyū-nomics.” One calculated that Kiyomiya’s team’s failure to make it to Koshien meant that a potential economic impact of ¥4 billion would not materialize. In any event, sighed Shukan Shincho (Aug. 10), with the Koshien tournament now out of the picture, young Kiyomiya is facing a “looooong summer vacation.” The Aug. 1 edition of Tokyo Sports predicted that by “X-day,” probably in late September, Kiyomiya would announce his future plans: to turn professional, attend university or explore other options. Among those other options is rugby. Nikkan Gendai (Aug. 3) reported that Kiyomiya, who played the sport through his fourth year of elementary school, has been the subject of speculation online that he’ll keep in shape by playing for a team during the winter season. “Many high school baseball players play rugby during the winter, so it wouldn’t be particularly rare,” a source in the Japan Rugby Football Association is quoted as saying. Whether home runs or scrums, a star has been born.